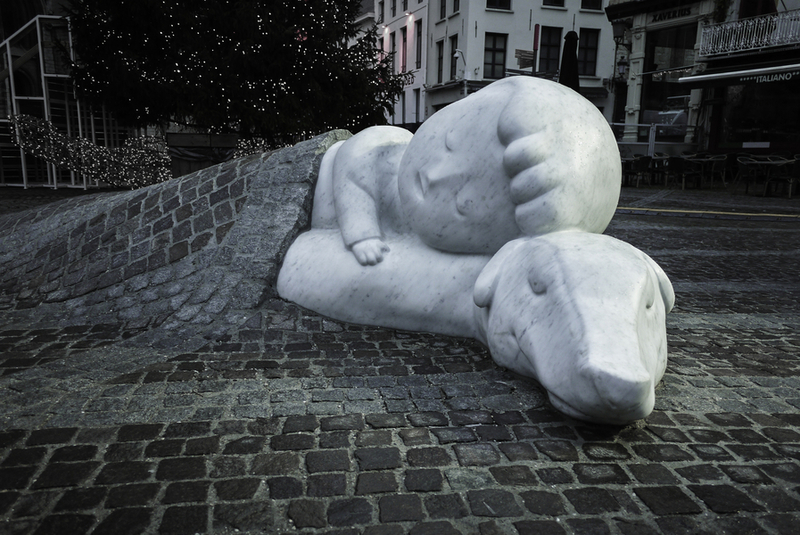 The story of the young boy Nello and his dog Patrasche is famous all over the world and it's set… in Antwerp! During the Christmas period the duo will play a prominent role in the city. Discover where you can meet them here. Nello and Patrasche are the main characters in the 1872 novel A Dog of Flanders. The story takes place in Hoboken and Antwerp. The Cathedral of Our Lady and various paintings by Rubens play an important role in the novel. Nello, a poor orphan boy, becomes friends with Patrasche, an abandoned cart dog. They walk to town together every day. They often visit the cathedral, where Nello admires the paintings by Rubens. Due to a series of setbacks, the lives of Nello and Patrasche end in that same cathedral. They die together from hardship. This moving and atypical Christmas story holds a message of pride and unconditional friendship. The story is very famous in Japan. Artist Batist Vermeulen (‘Tist’) designed a statue of the boy and his dog. You can admire the new statue on the Handschoenmarkt, in front of the cathedral. Based on the descriptions in the story, it has long been assumed that the Antwerp district of Hoboken was where Nello and Patrasche once lived. You will therefore find a few traces of the story there. At number 3 in the Kapelstraat, you will see a bronze statue of Nello and Patrasche, created by Yvonne Bastiaans. Furthermore, many people living in Hoboken believe Nello and Patrasche to be buried in the former churchyard at the Kioskplaats, which is now the park of the Onze-Lieve-Vrouw-Geboortekerk (Church of Our Lady's Nativity). Be sure to pass the Kiosk bakery, where you can taste some delicious ‘Nello and Patrasche’ chocolates.